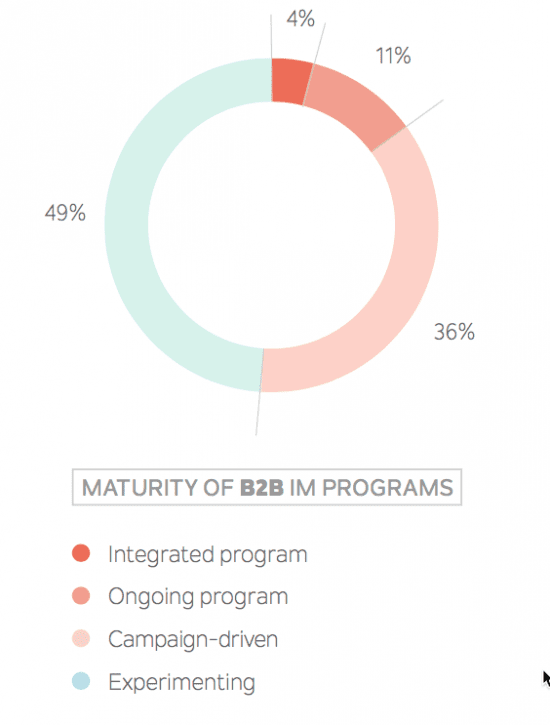 B2B Influencer marketing – how integrated is it? Chart of the Day: Is your use of influencer marketing mainly campaign-based or continuous or always-on? Our Managing digital marketing 2017 research report showed that integrating marketing campaign activities remains a major challenge, so it was interesting to see a new report from Traackr reviewing integration of influencer marketing. Their new report specifically considers influencer marketing in one sector, B2B technology, but references this research from a wider sample on the maturity of influencer marketing integration. "Many of the people we work with are micro-influencers. They may have smaller audiences, but they are really immersed in their topic. There are a ton of people out there who can be considered influential, but it is our belief that engaging with a set of 10 to 15 people over the course of the year is a good number to build strong relationships. If you're spread too thin, you're unable to provide people with a valuable experience and they're not getting a full look at what your company is doing." My recommendation is that, as with all digital marketing activities to generate awareness and demand, it's important to blend campaign and always-on activities. Our campaign timeline template is aimed at helping that since it combines different types of paid, owned and earned media to improve integration. Need help with your Online PR? How to find influencers as part of online outreach? Travel brands must select the right influencers to work with in order to see the best results and create effective stories Working with influencers can propel a travel campaign forward and help your company reach its audience more effectively. But …..